Today is Prohibition Repeal Day. 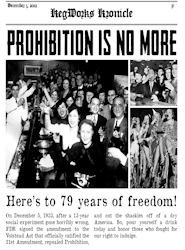 On this day back in 1933, the Federal Prohibitionary laws (18th Amendment) were removed and the 21st Amendment went into affect allowing for the return of public purchase & consumption of alcohol. And for the following 79 years, the U.S. has been enjoying the right to drink alcoholic beverages, with some restrictions of course. So hoist a pint today and toast to our right to have a beer! Let's hope nobody ever tries to take it away again. Here's what's happening around the Colorado beerosphere today Wednesday, December 5th, 2012. Bootstrap Brewing (Niwot) - In honor of Repeal Day and the old speakeasy, if you give your taproom server the password "Shrubbery" you will get 50 cents off pints today. And Monty Python fans know, if you fail to bring a Shrubbery they will say "Ni" to you. Kokopelli Beer Company (Westminster) - Today the upcoming brewpub got their final blessings to put Kokopelli Beer Company in the City of Westminster. Now they have to get the State to approve a Liquor License. They will officially be a "brewpub" since the City has only one small location zoned for Breweries in Westminster. Kokopelli will have handcrafted beers on tap and will be offering wines from the Four Corner States. More news on this upcoming business as it breaks. Renegade Brewing (Denver) - Renegade is expanding business once again, but this time it will be in the form of a 2nd uniquely branded restaurant called: Renegade Publik House. This restaurant will feature several dedicated Renegade beer taps as well as 20 rotating guest taps. The new location will be at 2043 S. University Boulevard in Denver, CO. Read all about it in today's Press Release. Prost Brewing (Denver) - ‎Prost Brewing Company is teaming up with Breckenridge Brewery of Colorado and the Ale House at Amato's in support of a toy drive to benefit the Starlight Children's Foundation. People who wish to donate can bring a gift for a child between the ages of birth through 18 years old to the Ale House from now until the 14th of December. When they bring a gift to donate they will receive a free pint of Brecks Christmas Ale. Prost will also be 1 of 6 breweries (pouring 2 beers each) participating in the "12 beers of Christmas" event on Thursday December 13th at the Ale House at Amato's. This 6-8pm event is $15.00 per guest or $10.00 with a gift donation at the door. All proceeds from this event will also go to the Starlight Children's Foundation. Avery Brewing (Boulder) - He's back! On December 12th, 5pm, at the Avery Tap Room bombers and drafts of The Maharaja Imperial IPA go on sale. Accompanied by tasty Indian cuisine and Bollywood films in the Barrel Aging Cellar, the Maharaja himself will be here, and will allow you to take pictures with him! 22 oz. bottles of his majesty will be available in Colorado retailers beginning in mid-December, and invading our other territories beginning early January. BJ's Restaurant & Brewery (Ft. Collins) - From the rumor mill and the Coloradoan, BJ's Restaurants wants to add a new brewery / restaurant in Fort Collins. They currently have several restaurants in Colorado with a brewing facility in Boulder. Stay tuned for more news on this possible venture. Left Hand Brewing (Longmont) - The tasting room is expanding their hours for the holiday season. December 17th to 22nd 1:00pm to 9:00pm. December 23rd 12pm to 8pm. December 24th 1:00pm to 5:00pm. They will be closed on Christmas Day (25th) and New Years Day (Jan 1st). CO Liquor Licenses (Colorado Springs) - KOAA News 5 in Colorado Springs recently did a story about the huge spike in liquor license applications in the area. Craft beer popularity here appears to be the main attraction for many businesses wanting to cash in on the popular "culture". Check out the video embedded below or visit their website. Butcherknife Brewing Company (Steamboat Springs) - Today's the day they started moving some dirt and breaking ground on their new brewery facility. All the permits finally got approved and they began construction. Look for building to be completed by the end of Spring 2013. Steamboat should have some great beers coming this summer. Eddyline Brewing Co (Buena Vista) - Distribution expansion of their canned beer continues. Here are some of the latest stores now stocked with Eddyline beer: Primo Vino (Boater, IPA and Red Chile Porter), Water Tower Liquor (All products), Little Raven (Boater and IPA), Park Ave Wine and Spirits (IPA and Red Chile), Canyon Liquor (IPA) and Argonaut (Red Chile Porter). They are working diligently to get the rest of their products into Argonaut Liquors.